Threading has this amazing ability to be so concise in the hair that it removes. It's sworn by people who say they can never get their eyebrows even, despite tweezing, waxing or sugaring. But finding a reliable threading service is equally challenging. While threading can be quick to learn with a few classes, it takes a lot of training and practice to master. There are several 'thread shops' in the NY/NJ area that offer services from therapists who have varying degrees of experience. 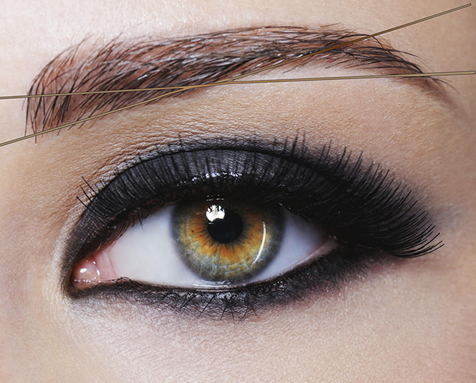 An in-experience threader can leave your eyebrows uneven and un-shapely. Worse yet, they can cause hairs to break. Done correctly, however, hair are pulled out from the follicles. At AuM, our threading expert, Neelam, has been threading for over 30 years. He experience and expertise leaves clients with amazing and long lasting effects, where every eyebrow is contoured and carefully curved.